17. "911 Is A Joke"
15 "I Don't Want Your Love"
14. "Union Of The Snake"
12. "White Lines (Don't Do It)"
9. "Is There Something I Should Know?" 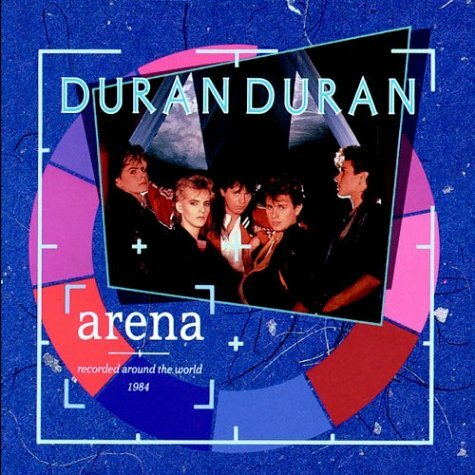 "Wild Boys" is the only studio track on the live album (yes, I said album...it was 1984 after all) Arena and was produced by Chic front man and dance music legend Nile Rodgers. The track, based on the William S. Burroughs novel The Wild Boys: A Book of the Dead, came to life after Duran Duran video director Russell Mulcahy suggested he wanted to make a film out of the surreal, dystopian novel and wanted Duran Duran to provide the soundtrack, something Queen would later do for The Highlander. The song combines a danceable edge - pounding electronic drums and percussive beats - with the hard-rocking guitar riffs of Andy Taylor. The result was a dark, danceable war chant more suited to the ravaged post-apocalyptic world of Mad Max than the clubs of Soho. Maybe that's why it's Duran Duran's highest charting single in Australia? 5. "A View To A Kill"
If you're a fan of '80s music, it's pretty likely you're a fan of Duran Duran. I am. And I am (got all the albums on vinyl--the only way to go for '80s music). But that's not why I like this song. Everyone has their favorite genre of music, and mine is an obscure one: movie soundtracks. I love movie music. I've got well over a hundred movie soundtracks in my collection. One of the main selling points when I decided to buy XM Radio was the fact that they have a channel that's dedicated to movie soundtracks, Cinemagic, XM 76. Listening to Cinemagic on a daily basis has resulted in a steady growth of my soundtrack library. My next door neighbor, one year younger than me, was ecstatic when she told me she'd bought the new record. I made fun of her. Duran Duran was soooo lame, I said. They had poofy hair and makeup. Why she'd bought that album instead of the way awesomer Let's Dance by David Bowie (cuz he never used guyliner and hair products?) was beyond me. And yet I ended up borrowing her record and making a tape of it, mainly because of "The Reflex." To this day, I have no idea what the song is about. All I know is, The Reflex is a lonely child who's waiting in the dark. Or by the park. Or near a lark. The song itself is still raucously fun. I've always thought it was both buoyant and snarly, made so both by Le Bon's wailing, and the push-pull tease of the chorus. It's got that signature electronic texture, but it's layered with sly guitar and percussive wood block (and, I'm convinced, some subtle use of cowbell). In the end, the song becomes one part dance track and one part anthem. And you have to admit: Simon Le Bon belts it out. He was never one to lounge his way through a song. I was four years old when "Girls On Film" came out, though I didn't get to know the song for a few more years. My father and I had a regular habit of cruising the city streets in his grey Mustang, singing along to the hits on Casey Kasem's American Top 40, and I remember hearing "Girls On Film" for the first time in the front seat of his car. Alongside "Hungry Like The Wolf," it quickly became one of my favourite Duran Duran songs. It reminds me of my father, who would sing along with me in the car, and of my teeny-bopperish, teenage babysitter, who brought her copy of Duran Duran - on vinyl, of course - with her every time she came to babysit. We'd put the needle on the record and dance around my living room, singing into hairbrushes-slash-microphones: Girls on film (she's more than a lady)! Girls on film (see you together)! "Rio" is a song that defined a generation. If you're making an '80s mixtape, "Rio" is a must. "Rio" IS the '80s. Even though there are lines in "Rio" that I don't think even Simon Le Bon understood ("With a step to your left and a flick to the right you catch that mirror way out west"), my thirteen-year-old mind could see the big picture: "Rio" was about The World's Most Beautiful Girl. While the dagger-clad woman that emerges from the water in the "Rio" video might have played a role in my conclusion, it was the words that came slithering out of Simon's mouth that won me over. Rio was a girl who danced "on the sand just like that river twisting through a dusty land" and made a guy "feel alive, alive, alive" with her "cherry ice cream smile." I wanted a Rio! 1. "Hungry Like The Wolf"
We showed you ours, now show us yours! What's your favorite Duran Duran song?